Applause and congratulations: On 28 June 2016 prudsys recognized the winners of this year’s DATA MINING CUP. 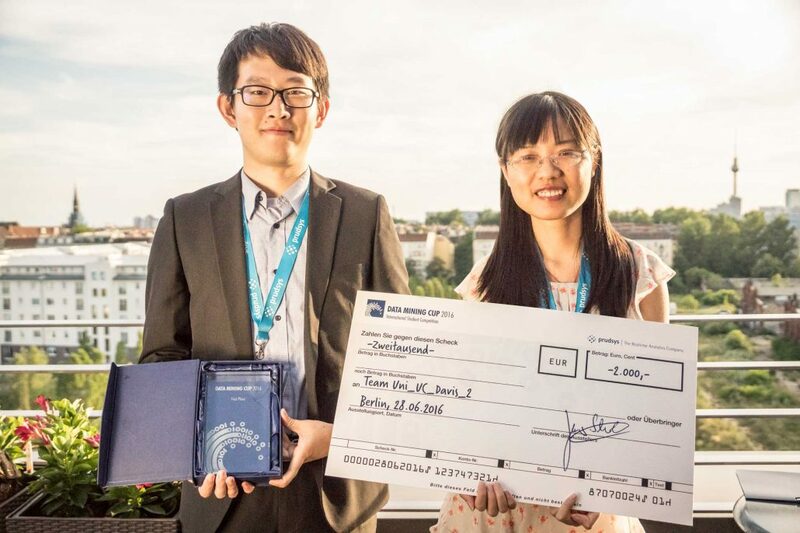 Students from the University of California (Davis/USA) prevailed against 87 other universities from 30 countries at the world-renowned student competition in the field of intelligent data analysis. They took first place and received 2000 Euros in prize money. Every year prudsys AG, a company specializing in real-time personalization in retail, calls on students from all over the world to test their expertise in the field of intelligent data analysis. As in previous years, the task of the competition was to solve a real-world problem. Competitors took anonymized historical order data from a real online shop and used it to develop a model that makes it possible to predict new orders including their returns. The teams had a total of six weeks to submit their results. 120 teams from a total of 88 universities from 30 countries took part in this student competition. Each educational institution was allowed a maximum of two teams. The University of California (Davis/USA) team captured first place and was awarded 2000 Euros. Second place and 1000 Euros went to students on team 2 from Iowa State University (USA). Team 1 took fifth place. Team 2 from the Technical University Darmstadt secured third place and 500 Euros. Also included among the top ten teams were participants from the University of Bamberg (team 1), University of Potsdam (Hasso-Plattner Institute), the Swiss Federal Institute of Technology in Lausanne (team 1) and Austral University in Argentina (team 1). That was a total of four international universities in the top ten. As part of the prudsys personalization summit from 28 to 29 June at andel’s Hotel in Berlin the best up-and-coming analysts at the DATA MINING CUP 2016 were awarded prizes. The prudsys personalization summit is the key event for news and trends in the field of dynamic omni-channel personalization in retail. Numerous well-known industry experts and companies such as Klingel, Würth and 1-2-3.tv took part in the conference.